The Mummy (1932) | B-Movie BFFs! 1932’s third film in what is commonly thought of as the Universal classic monster films (the talking pictures, anyway), 1932’s The Mummy is the more lush and sophisticated when compared to 1931’s Dracula and 1931’s Frankenstein. The film also employs actors from the previous two – for instance, Edward Van Sloan plays the expert doctor in all three, and David Manners the rather ineffective male love interest in both Dracula and The Mummy. Most contemporary viewers have seen modern versions of the mummy legend, but this is rather the granddaddy of most. The film also came on the tail end and is perhaps the most well-known of early Hollywood’s fascination with Egyptian storylines; early cinema had already produced over forty films on such material. In the film, we open in 1921 when an archeological expedition led by Sir Joseph Whemple (Arthur Byron) finds a tomb, corpse, and mysterious scroll in a dig. The mummy they’ve unearthed is Imhotep (Boris Karloff), and as they pore over the runes on his sarcophagus they discover he was tortured and executed for some gross sacrilege. They also discover that by messing with the scroll they’ve unearthed (the mysterious Scroll of Thoth) they risk the wrath of the gods (or so the hieroglyphs say). At this point, Whemple’s colleague Dr. Muller (Edward Van Sloan), an expert in Eastern occult, pulls Whemple aside to urge the scientist to abandon the scroll, and destroy it if possible. While they are quibbling, Sir Joseph’s assistant Ralph Norton (Bramwell Fletcher) furtively opens the scroll, and sweatily whispers the incantations. You guessed it: the mummy awakens – to steal the scroll and terrorize Norton. The other two scientists burst into the room and find Norton laughing madly, and both the scroll and the body missing. Ten years later, Whemple has left Egypt for good. His son Frank (Manners) works alongside a Professor Pearson (Leonard Mudie), pillaging Egypt’s tombs. They complain about the lack of a significant find; as they bicker, a mysterious Egyptian darkens the doorstep and introduces himself as Ardath Bey (Karloff, again). Bey tells the two men he will lead them to a significant find: the tomb of Princess Ankh-es-en-Amon. Ignoring any misgivings at this strange, creepy stranger, the two archeologists eagerly agree. Both Bey and the younger archeologists’ movements soon introduce us to Helen Grosvenor (Zita Johann), a young woman Egyptian on her mother’s side, and fathered by a colonial governor in the Sudan. Bey is smitten, and is immediately sure she is from the lineage of Princess Ankh-es-en-Amon, if not the Princess herself reincarnated. Flashbacks ensue, and Helen begins to experience the confusion of being both herself – and someone else, someone drawn to this mysterious stranger. The gentlemen scientists are soon on to Bey’s game though, and try to resist his designs on Helen. Employing powers of telepathy, as well as blood-lineage sway over the household servant – dismayingly referred to as “The Nubian”, and played in blackface by actor and history-making producer Noble Johnson – Bey (who is indeed the revived Imhotep), manages to secure Helen/Ankh-es-en-Amon in the temple. Will our bumbling heroes arrive in time to save her? I love The Mummy. The pacing is good – if, yes, it does employ a lot of stuffy fellows talking in drawing rooms – and of course, Karloff is riveting. Zita as Helen/Ankh-es-en-Amon is also compelling, even if her affection for the milquetoast Frank seems difficult to believe. 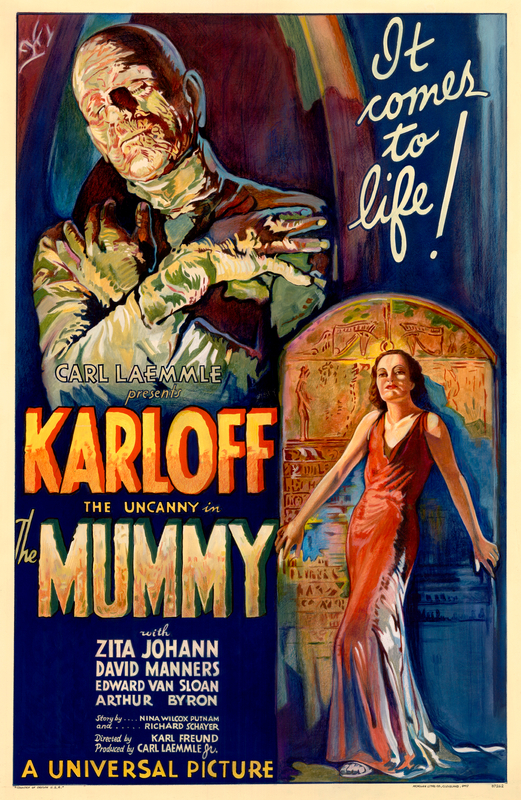 She is courageous and gorgeous; her costumes and gowns rank alongside Karloff’s mummy makeup in terms of glamour. The score is a bit uneven; the credits open with “Swan Lake”, and there are periods of both tension-laced orchestral bits – and utter silence (the latter most notably when the mummy awakes). The film is if not racist, at least racially insensitive and steeped in Western Imperialism with its portrayal of the Egyptian people and history, and its digs at the “modern” (Islamic) Egypt versus the “Classic” one of 3500 years ago. Well-executed and beautiful, The Mummy is an absolutely essential film for any horror fan, and especially any monster movie completist.